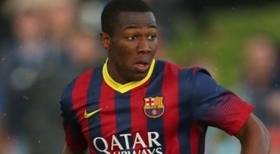 Adama Traore is yet another starlet to have emerged from Barcelona. In recent seasons, the likes of Munir and Sergi Samper have come through the ranks, hot on the heels of the likes of Marc Bartra and in years prior to that, Lionel Messi. Adama Traore looks to be yet another excellent prospect fresh out of the Camp Nou. Traore, who is is also known simply as 'Adama', is a Spanish right winger of Malian descent. Adama joined Barcelona's youth setup at the age of just 8, and last season finally made his first appearance for Barcelona's B team. The 18-year-old impressed there and is expected to feature regularly for Barca's first team in the coming few seasons. Having already appeared for Spain's under 16, 17 and 19 sides, many expect Adama to also eventually push on to become a full international. This season, Adama has been assigned back to Barcelona's B team where he will receive further coaching and development until finally pushing into the first team squad on a regular basis. Adama is famous for his mazy runs down the left flank. With excellent dribbling ability, Adama is most comfortable with the ball at his feet; but is also seen as a flair player who is a good crosser of the ball. Traore has been linked with a loan transfer out of Barca in January, with the likes of Granada and Villarreal both rumoured to have shown some interest. With time, Adama is certain to become an excellent professional footballer. With Luis Enrique already having had experience coaching Barcelona's B side and proven record bringing players up through the ranks; expect Adama to feature regularly over the coming seasons.